Ms Munira Salim, is a Lecturer and Head of the Department of English, Stewart Science College, (Govt. aided) Cuttack, Odisha. 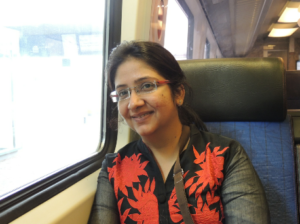 Her research interests include Subaltern Studies, Feminist Studies and Indian Literature. At present she is pursuing for her PhD in Ravenshaw University, Cuttack, Odisha. In her PhD dissertation she is focusing on the selected autobiographies of Dalit Women. She has presented papers in India and abroad. In her Conference presentations, she has presented papers on’ Eco-criticism’, ‘Bama’s Karukku’, ‘Writing and Disseminating Dalit Literature’, ‘Ecofeminism, from the Marginal Perspective’, ‘On the Issues of Transboundary River and the Environmental Refugees’. She also teaches Communicative English at graduate level since 2006.